1. 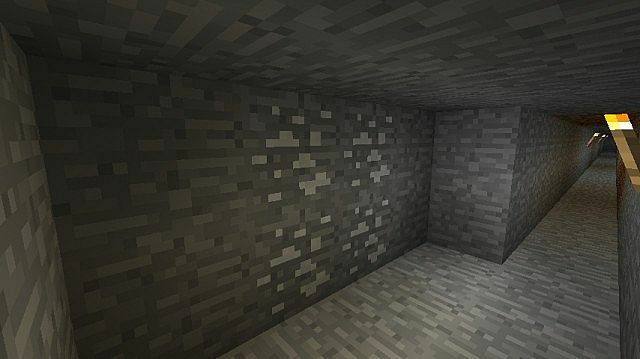 Silver Ore found underground, not as rare as gold, but less popular than iron, and is found in veins of roughly 1-10 at layers 60 and under. They can be smelted to make silver ingots. 2. Silver Ingot, can be crafted into a $100 bill, or 9 of them can make a Silver Block, which is just used as decoration. 3. Penny, Nickel, Dime, Quarter, $1, $5, $10, $50, $100, $500, $1000, $5000, $10000, $50000, $100000, $500000, and $1000000. Five $1 can be crafted into a $5, Two $500 into a $1000, One $50 into five $10, ect. 4. 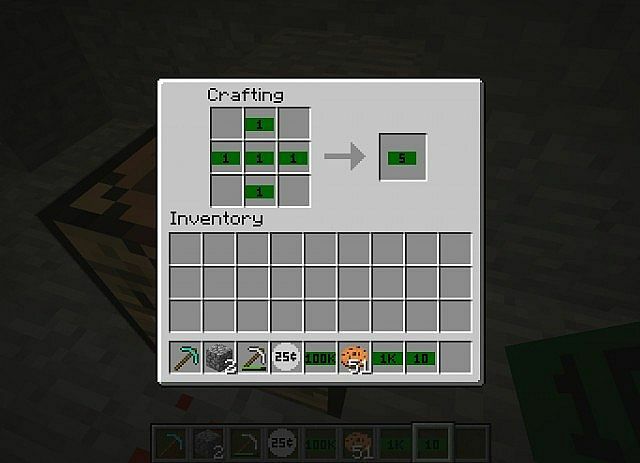 Placing these dollar bills into a crafting table will make different items in the game. All of the prices and recipes can be found in a text document when you download the mod. NOTE: Not all of the items and block in the game can be crafted with money! Only the ones I felt needed to be in there. If you have any suggestions about things to add, I'd be glad to hear them! A full list of the items and blocks and their prices are found in a text document when you download the mod. 5. A $100000 bill can be crafted into a "Spawn Block" Which will give you 100 spawn tickets when mined. 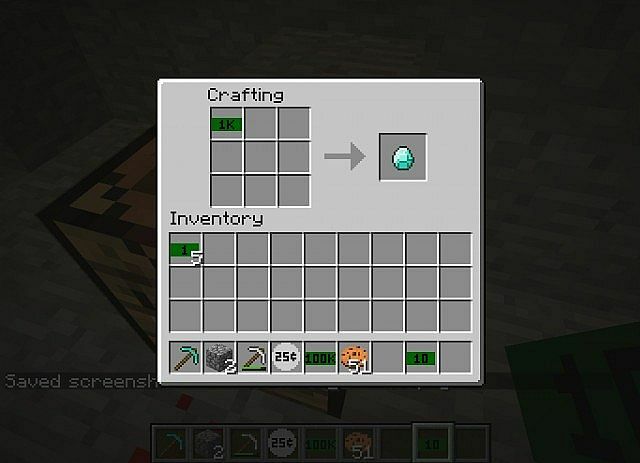 You can then use 1 spawn ticket to get any spawn egg that exists in the game by crafting them. Just experiment with that to get the hang of it. You can also get 32 Spawn Passports with a spawn ticket, which when 1 spawn passport and a $1000 bill is crafted, it makes 1 spawn ticket again. This is used to make it where you can buy a single spawn ticket without going up to $100000 to get 100 of them, but you must do that at least once first. 6. A $1000000 bill is the ultimate goal, and it can be crafted into an Ultra Block, which will give you 10 ultra tickets when mined. One ultra ticket will give you...well, it's a surprise, find out for yourself! I will say that it's well worth it, but not overkill either. There are also ultra passports that work just like spawn passports, except they're crafted with a $100000 bill. 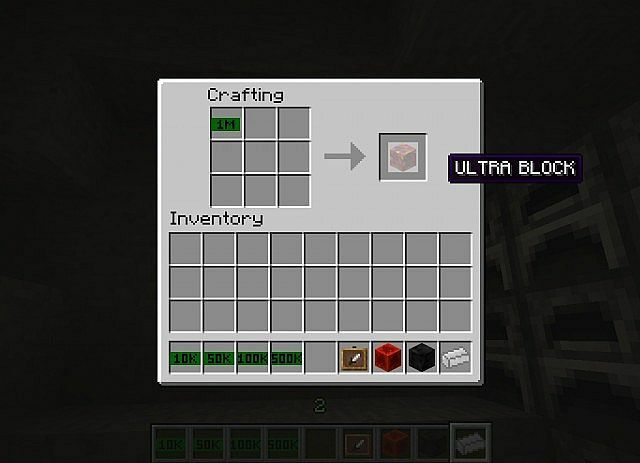 NOTE: An Ultra Block cannot craft things. It can be placed once, and then mined to get 10 ultra tickets. After that you cannot get the ultra block back. 1 ultra ticket can be crafted to get any of those cool-looking blocks that you see in the second picture. Then that block can be placed once and mined to get a prize. Spawn Blocks work basically the same way, except with spawn tickets and stuff instead of ultra tickets. So the Ultra Block and Spawn Block are exclusively prize blocks. 8. 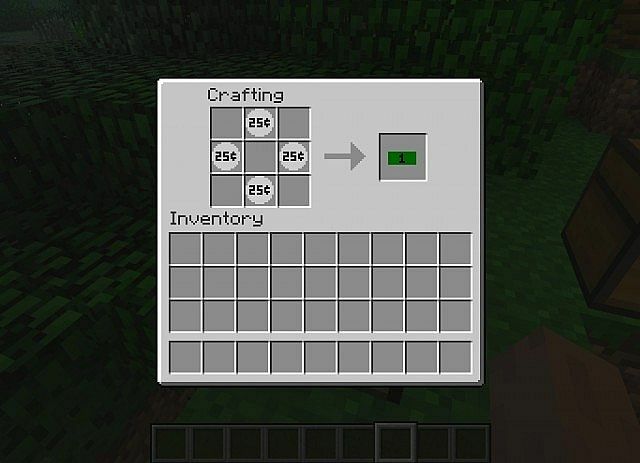 This mod is compatible with my other mod, "Epic Cookie Mod", so be sure to try that out too! 1. Download ModLoader 1.6.2 by the link below and put the contents into your 1.6.2.jar file. 2. 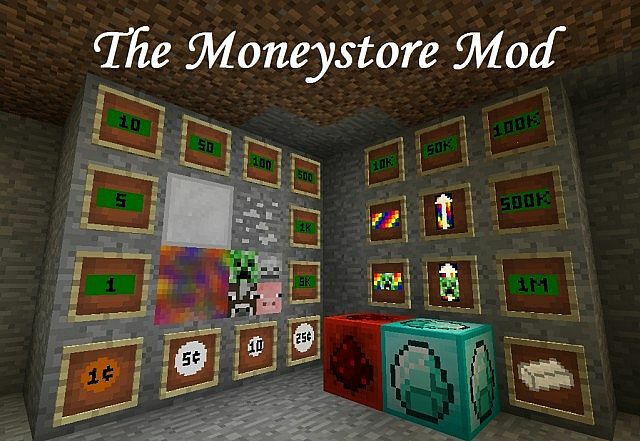 Download The Moneystore Mod and put the contents into the 1.6.2.jar file too. 3. Delete the META-INF folder in the 1.6.2.jar folder. Just scroll down until you see the Modloader section, then click "Download (Direct)". Dude, I have 1.6.2 but it crashes my minecraft. That's weird, i haven't seen any porblems with it before...maybe it's ur computer? Can you update this to 1.6.4? I can't yet because I can't get 1.6.4 MCP to work. Once I get it working I'll update it tho. FORGE!!!!! I can't download this even if I wanted to! long story short, is it compatible with forge? NO! This is the exact mod I have been searching for such a long time, and it's not for the new update, so I can't use it!!! :( Update SOON please! FINALLY!!! !A MOD THAT ADDS ACTUAL MONEY!!!! !Diamond for you!Also, add piggy banks to hold the money!Also for decoration! awesome. I love it. 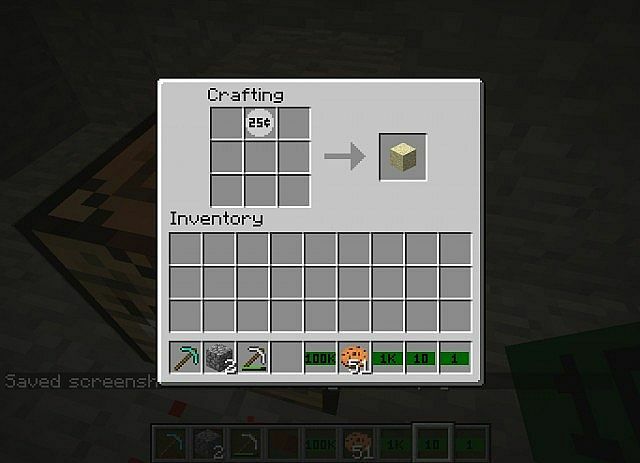 Make it so that when you spawn you get a ultra block or spawn block to get some items! Yes.. Maybe just one ticket??? So you can get one thing? Like, maybe you get a diamond pick at the start? Well one ticket has a lot of stuff too, way overkill for the start of a map. But what I might do instead is add $100 to the bonus chest that you can start with, which would let you get a full set of stone tools (and a sword) and still have a little extra money on top. But idk...I'll think about it. It won't let me for some reason. There seems to be a glitch in the coding where the inventory can only hold up to 64 of anything, even if you change the number to higher. I've heard this is going to be fixed in 1.5, and if it does, then I might do something with that. actually, using forge, I believe you can change max stack size on items without editing any base files. U can with modloader too. But the inventory still wont allow more than 64 for some reason. can i make a video on youtube for this? Sure! Just make sure to read the whole description first so you really understand the mod. Thanks! Yes I know, I just had an Item and Block class to keep them organized, and a Dust class has a specific reason for being separate. Thanks, I'm glad u liked it! It'll be 100% complete once the website will stop glitching up and let me put the most recent version out there jsyk. Sure! Idk if I can put it into the post, but I can put a link to where the video is on youtube. Just make sure that you read my whole description so you know how everything works before making the video plz. Thanks! Very cool, Diamond 4 U!!! It takes modloader. It won't work with forge. Actually you can. The mod-maker isn't very experienced, so he wouldn't know, but forge includes modloader pre-installed. yea i haven't used forge b4 so i didn't know that. Thanks 4 telling me! No I don't think so, it must be modloader. I'm not familiar with forge so I probably wont be making a forge version either. Sorry. Wow it looks great! 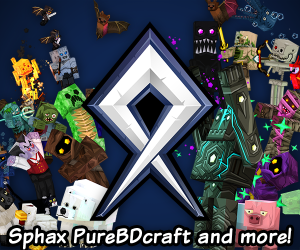 I can see how it took 3 hours to make :) But lemme just explain how the whole Ultra Block thing works really quick. An Ultra Block cannot be crafted. It can be placed once, and then mined to get 10 ultra tickets. After that you cannot get the ultra block back. 1 ultra ticket can be crafted to get any of those cool-looking block such as "4000 Blocks of Coal!". Then that block can be placed once and mined to get 4000 blocks of coal. Spawn Blocks work basically the same way, except with spawn tickets and stuff instead of ultra tickets. So they're exclusively prize blocks. Oh, and how much do u think bedrock should be? I didn't quite understand if u said it was overpriced or underpriced. And about the wallet, I DEFINATELY would do that...but only if I know how! I'm actually a new modder and I only know how to make simple items and blocks, and a couple other things. But I'm learning more and more every week. I'll see if I can get that to work. Maybe, I really don't wanna sound mean, I know u put a lot of time into it and all, but there is some incorrect information that might throw some people off track about the mod..those problems are mentioned in the comment about this one. If you can change it so those things are fixed, then I definately will! P.S. I'm going to be gone for a couple days so I'm not going to be able to reply until then. I would really appreaciate it if you could teach me how to make mods! nice mod, do you want me to do a mod review on it? 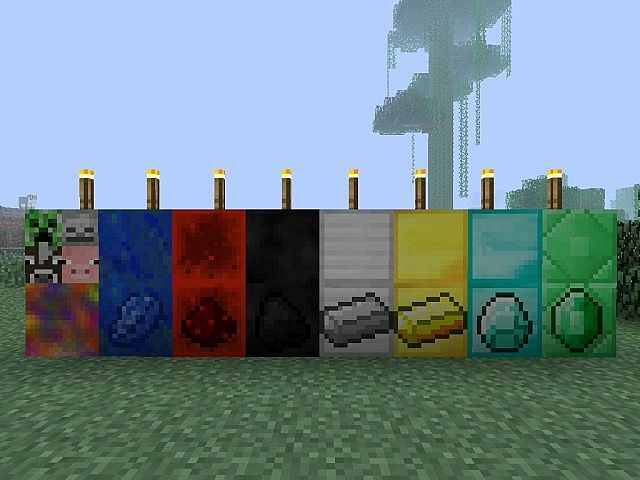 nice work, but it would be better if u put screenshots of all crafing recepies u made . Ya I would ifÃ I could, but it'll only let me post 10 pictures. If you need to know about how to craft something in particular, I can tell you how. And thanks! do u use linkesy's modmaker or what? no i mean what program do u use for maing mods?